As a teenager I started spinnfishing, one day a good friend of mine endowed me an old cheap fly rod. After a bit of practice I totally fell in love with this kind of fishing. To see a trout rising for your fly can’t be compared to any kind of bait or spinnfishing. Getting connected to nature. For me fly fishing is the best method to get in touch with it. I always tend to keep it simple and bring as less as possible to the water, so you can enjoy the environment much more. I live in Munich, in the southern part of Germany. There I have a small creek just a stone’s throw away from my home. So i’m in a fortunate position to cast my fly nearly every day, even though its only for one an hour. Most of the common species are native chubs and barbs, a few brown and stocked rainbow trouts. Due to this different kind of fish, fishing is very diversified. Furthermore there is a huge variety of rivers within one hour drive. What’s the height of the season for you? Every time of the year has its own charm, but casting your rod after the spawning break is a very special moment every year. What time of year is your personal favourite? Staying outside, enjoying the nature is most important to me, it doesn’t matter what time of the year. 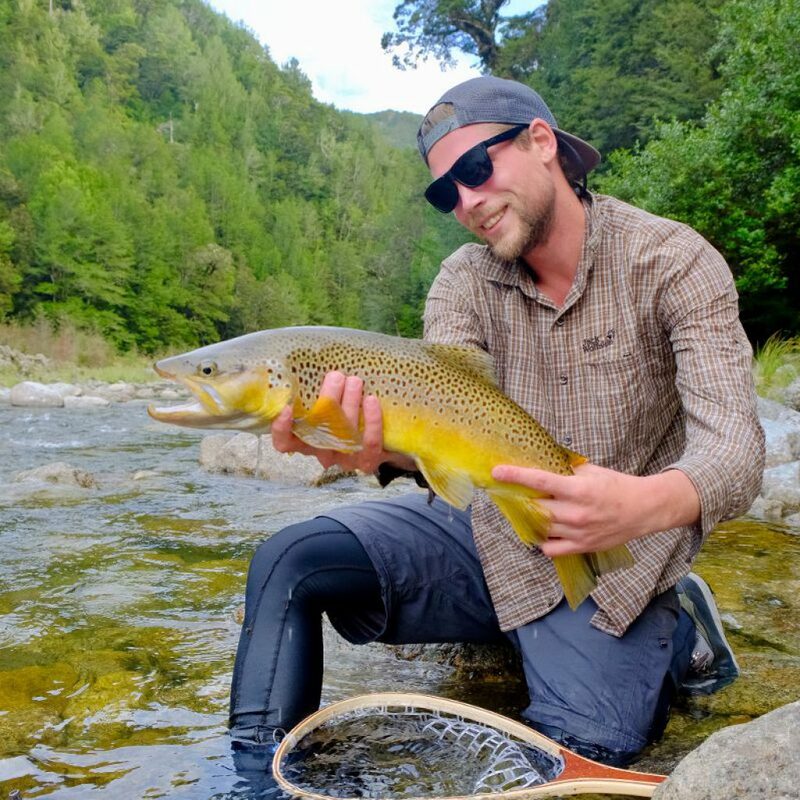 Definitely New Zealand with the variety of pristine, crystal clear and untouched waters and always the chance of catching a trophy trout. It’s just a fly fishing paradise! Im very pleased with the waters I have nearby in Bavaria, Austria, Italy and Slovenia. But my big dream is to go for taimen in Mongolia. Im addicted to sight fishing especially with the dry fly. 90 % of my fish I catch within 10 meter range or even less. Therefore I need an accurate and soft presentation. So the Thomas&Thomas Lotic 744-3 fits perfect for me with its medium fast action and smooth delivery. Due to its softness you can fish for the big ones with a 6x or 7x tippet, without the fear of breaking it off. Depends on the kind of water and species you are going for. For riffels and fast or pocket waters I mainly use big dries, size 12 or even bigger, like attractor patterns. For slow moving stretches I prefer small caddies or mayfly patterns. If the fishes are picky and focused on any type of bugs in particularly, you have to match the hatch. Nevertheless a goddard caddis is always in my tacky box.